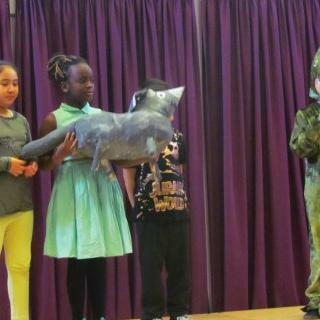 South Grove Primary School - ASSEMBLY: 4B Dinosaurs Rock and Roar!! ASSEMBLY: 4B Dinosaurs Rock and Roar!! Year 4B did a fantastic job at making the first few rows of the assembly jump out of their skins during their assembly on Friday! The school and large parent audience were treated to fascinating facts about dinosaurs and the children had learnt so much about them. Their 3D dinosaur models were fantastic and very professionally made. The children enjoyed their dinosaur rap supported with actions from Miss Matthews which they thoroughly enjoyed. The dinosaur dance was executed really well and the children ensured that the audience began to join in!! Our thanks to Mrs Baker for supporting the children to do really well in their class assembly. Well done 4B!